New cars and motorcycles must be registered. Registration costs are based on engine size. Registration can be processed at the license bureau on Sukhumvit in Naklua. Before you buy a used car or motorcycle be sure that the registration papers are in order. 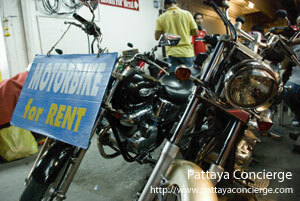 Cars, jeeps, and motorcycles can be rented on Pattaya Beach Rd and sois adjacent to the beach. Be sure to ask whether insurance is included in the rental or even available. Some problems have been reported with street rentals, caution is advised. There are many small companies offering lower rates but these may prove costly in time and effort, if the car isn't serviced properly. Major companies include. Obtaining full insurance cover in Pattaya Thailand is very important as accidents and losses are high. Since there are a great number of accidents it is important to take out a fully comprehensive policy with a reliable company. (Although insurance is now compulsory in Thailand many cars remain uninsured.) Make sure that the fine print is explained fully and that you know the limits of liability. Reputable insurance companies and car rental agencies, will give you a card explaining the procedure in case of an accident. Included on the card are phone numbers of the insurance agency or agent. • You must have an International Driving License or Thai license to validate insurance. • If you are not covered by a valid insurance policy you will have to pay for all damages or losses while the vehicle is rented to you. Avis and VIA rentals are covered by insurance. • If you rent a car or borrow a friend's car that does not have insurance, you can buy liability only insurance. If you plan to drive it is advisable to obtain an International Driving License in your country, before going abroad. Although it may be valid for one year, it is advisable to apply for a Thai Driving License after four months. • Obtain a doctor's certificate showing that you are in good mental and physical health. The doctor can obtain this certificate at any of the hospitals or clinics following a brief interview. • Immigration must certify that your visa is acceptable. This procedure will cost B500. • You must bring your passport; two photocopies of the picture page, visa stamped pages, and two passport photos. • Take the papers from the Immigration office to the License Bureau on Sukhumvit, near Banglamung District Office (on the left side of the highway). License application is on the second floor. A color blindness test will be given. • Written and driving tests are required if you do not have a valid license from your own country. • The passport copies and photos are required for the license. 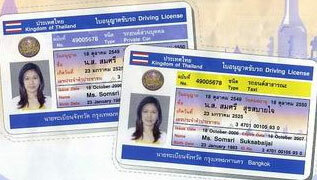 The Thai license is valid for one year and can be renewed twice. • If you have resident status, you must have a Thai driving license to drive in Thailand. • If you have a tourist or non immigrant status a valid International Driving License or a Thai license is required. If you commit a moving violation (speeding, Jumping a red light, etc. ), you will be fined Bt.100 to Bt.500, payable either on the spot or at the police station. If your wheels are clamped because you are parked illegally, the fine can range between Bt.100 (for holders of 'Thai licenses) and Bt.400 (non-Thai license). Since the 15th of September 1994 the wearing of crash helmets has been compulsory in Pattaya (but look around and draw your own conclusions!). 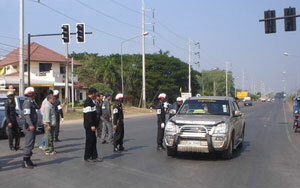 There are many fatal and non-fatal accidents in and around Pattaya. If you hurt a Thai and it is your fault, you will be expected to make financial compensation, to the family and the individual. • Wear a helmet when riding a motorcycle. • Do not rent a high performance motorcycle if you are not accustomed to using one. • Watch out for loose gravel, sand and potholes on road curves. • Watch out for dogs and wandering animals on the roads, even in town. The following Rules of the Road will help you understand driving in Thailand. If you are fortunate enough to have a driver, sit back and relax. Otherwise, pay close attention, as driving in Thailand is very different from anywhere else. Accidents are serious in any event and become more serious when a foreigner farang' is involved. • The speed limit is 90 km per hour for pickup trucks, and 120 km per hour for cars on the highways. The speed limit in town is 40 km per hour. These limits are often ignored by drivers but are the law. • Stay in the left-hand lane except when overtaking another vehicle. Refrain from staying in the right-hand lane too long, pass vehicle(s) and go back to the left-hand lane as soon as possible. Police will stop you if you keep in the right hand lane without a signal. This happens frequently along Sukhumvit between Sriracha and Jomtien. • Do not park if the curb is painted red & white, or yellow & white. • Do not park in front of a loading area or driveway. • It is quite usual to leave your car in neutral with the parking brake off in a car park, so that it can easily be moved by the attendant to let other cars in and out. • Vehicles on your right and already in the roundabout have the 'right of way'. However, do not dispute with buses or trucks. It is an unofficial law that the larger vehicle has the 'right of way' over the smaller vehicle. • Signal when changing lanes and/or overtaking another vehicle. • When you are in the right-hand lane of a four-lane road, move to the left-hand lane when a vehicle behind you flashes its lights and/or sounds its horn. • At dangerous intersections (cross traffic has stop signs, or yield signs) put on hazard lights as you cross the intersection. (E.g. the intersection between the Highway to Rayong (Route #36) and Sukhumvit (Highway #3). • An oncoming vehicle flashing its headlights is warning you that it is coming through, and oncoming traffic should get out of the way. This can also happen when the overtaking vehicle has not anticipated the distance required passing. Buses and 10-wheel trucks are notorious for forcing on-coming traffic off the road on two lane highways. BEWARE! • Lane markings are not enforced. Drivers often cross solid yellow lane markers, passing on hills, blind curves, passing on either side and in the face of oncoming traffic. Being alert is the only defense, so slow down and move over if need be. • Traffic lights frequently burnout and are not replaced for weeks. • Be cautious at North, Central and South Pattaya Road intersections with Sukhumvit, also at these intersections, as you turn right (South) onto Sukhumvit watch out for vehicles coming from your left (North), quite often they do not stop for the red light. Frequently, drivers will jump red lights. • As a pedestrian, cross the road when clear and safe. • Watch out for pedestrians who dart across traffic lanes, especially at night. • Street vendors with motorcycles and sidecars are often on the streets and highways without proper lights at night, they are difficult to see. • Drive slowly and beware of this hazard! • Be alert at all times. • Driving is not the time to sightsee or let your mind wander. • Be particularly careful of motorcycles, bicycles, pedestrians and dogs. They can be a menace and are often the cause of 'fender-bender' accidents. Motorcycles and bicycles are often traveling down the wrong side of the road. Watch Out! • Keep cool and use common sense; do not panic. Do not flee the scene! • Do not move the vehicles until the police report has been filed. • Only vehicles not involved in the accident should be used to take injured persons to the hospital. • Try to obtain the names and addresses of injured persons and of all witnesses (including passengers). • If possible, take photos of the scene before cars are moved. Note impact damage on both vehicles. Note registration numbers of all vehicles involved. • Try to find English speaking Tourist Police whenever possible. • Do not admit liability. The police and the insurance company will define liabilities. • Do not make any comments to anyone except to the police or a representative of the insurance company. • Make a copy of this procedure and keep it in the glove compartment, with the telephone number of your insurance or car rental company.